Will there be any more snow this winter? The moon orbits the earth around the earth's mid line. The earth is tilted on a 23deg lean, but of course the moon has no brain and cannot know that. The moon orbits the earth anyway over the course of a 27.3-day month and at the rate of about 13deg through space per day. Because of earth's tilt effectively the moon's position changes from one hemisphere to the other every 13-14 days. To cross hemispheres the moon crosses the equator twice a month(lunar equinox). The furthest south the moon gets is called southern declination and the furthest north, the northern declination. At the moment the southern declinations reaches to 21degS latitude, before returning northwards to reach 21degN latitude. This latitude changes over 18.6 years, such that there is a maximum declination reached every month of 28degN and S, and about 9 years later a minimum declination point reached each month of 18deg both N and S.
The last maximum declination year was 2006 and the last minimum declination year was 1997. Last year, 2011 was the midpoint declination year of 23degN and S, and we are coming up to the next minimum declination of 18deg both N and S in 2015. The midpoint years typically bring the colder winters and the better snow seasons, and the maximum and minimum declination years some of the warmest winters and the poorer ski seasons. For example, on or near maximum declination years were 1967, 1988, 2005 (until Sept), 2007 and 2008 and were milder winters. On or near minimum declination years were 1959, 1978, 1994 and 1995 (August), and brought less severe winter seasons. But some of the approximately midpoint years such as 1939, 1945, 1972, 1982, 1992, 1996, 2001 and 2008 have accompanied colder winters. The reason is to do with combinations of midpoint declination years and new moons in perigee over winter months. Mid point years correlate with El Nino years, with more frequent winds from the south. It is easy to find out which years these are, and therefore to predict what the seasons are going to be like well in advance. All it requires is openmindedness to the idea that the moon influences weather just as it influences tides and tidal patterns, and a willingness to search for cycles. Anyone can see that the water and air are joined at the sea surface, covering 75% of the globe. But it is sad how climate scientists miss how the moon might possibly have influence on weather patterns, possibly because they spend their days searching for evidence of climate change to qualify for government funding. By plotting the monthly movements of the moon we can forward calculate when colder parts of a season may arrive. Because the moon's declinations are at around 21degN and S at the moment we cannot expect an overall cold winter season, but there will still be the odd freezing southerly system and polar blast bringing snow dumps. The milder overall winter season this year means that when the moon is not over the southern hemisphere, any of those winter rains will be warm enough to wash away snow previously fallen. Southern declinations bring southerly airflows and colder weather to the South Island and most winter snow falls just after southern declination, as the moon is beginning to trek northward. The southern declinations this winter have been on 8 May, 5 June, 2 July, 30 July, 26 August, 22 September, 19 October and 16 November. A look at what wintry conditions arrived this year around these dates should prove the logic of this reasoning. From 9 May, exactly on cue for the first winter southern declination, over the following week snow arrived off and on for Ruapehu, Queenstown and Wanaka. On 10 May, Tasmania received snow as low as 600 metres. On 4- 6 June, the next southern declination, Canterbury was hammered with heavy snow from a wintry blast as the full brunt of a southerly kicked into gear. Power outages were reported and some schools closed in areas south and west of the city. The 1st of July was within 24 hours of the most recent southern declination, and very low temperatures greeted southerners with hard frosts recorded in many areas in sub zero conditions. Dunedin airport and Queenstown got as low as minus seven degrees. Australia too suffered. On 3 July the outback had a freezing night with some places having their coldest night in several years. One of the coldest spots was Alice Springs. On 4 July Queensland shivered through its coldest night of the year with many places dipping below 0c. So we can very confidently expect our next wintry polar southerly blast within a day or so of 30 July which is the next southern declination. The big snowfalls this year are due in August and October. 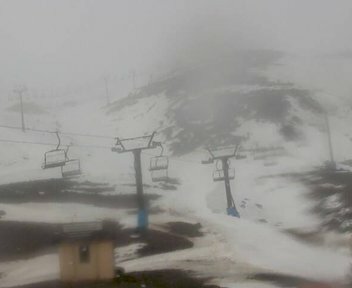 Between southern declinations we may continue to see rain washing much of the precious snow away, to the disappointment of ski operators and inconvenience to families who may have bought season tickets. Last year was disappointing for Mt Hutt, nicknamed Mt Shut, and the sooner the cycle is recognised the better it will be for tourism, because of better spending of our promotional dollar. For instance the next fantastic seasons should be 2016 and 2017. I suggest booking for them now.